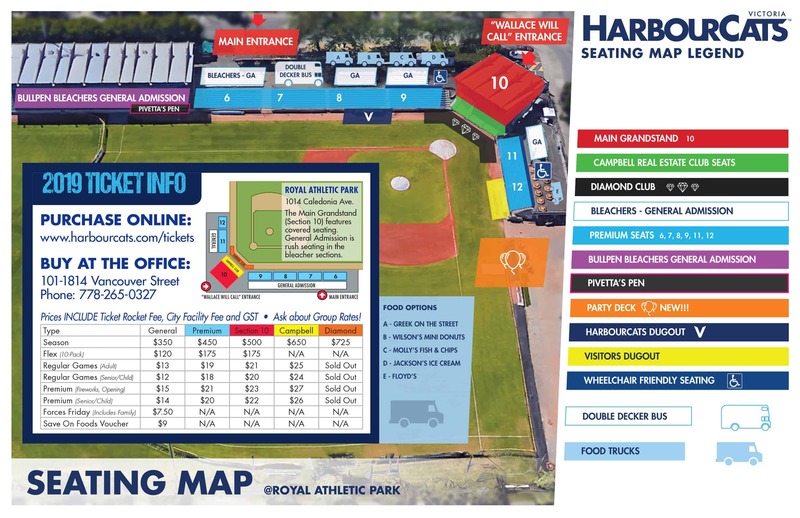 August 25, 2018, Victoria, BC – The Tecumseh Thunder (Ontario 1), Team Quebec and New Brunswick punched their way into the playoff rounds Saturday morning with wins respectively over the Oak River Dodgers (Manitoba), Red Deer Riggers (Alberta) and Sydney Sooners (Nova Scotia) in the 2018 Baseball Canada Men’s National Championships being held in Victoria. 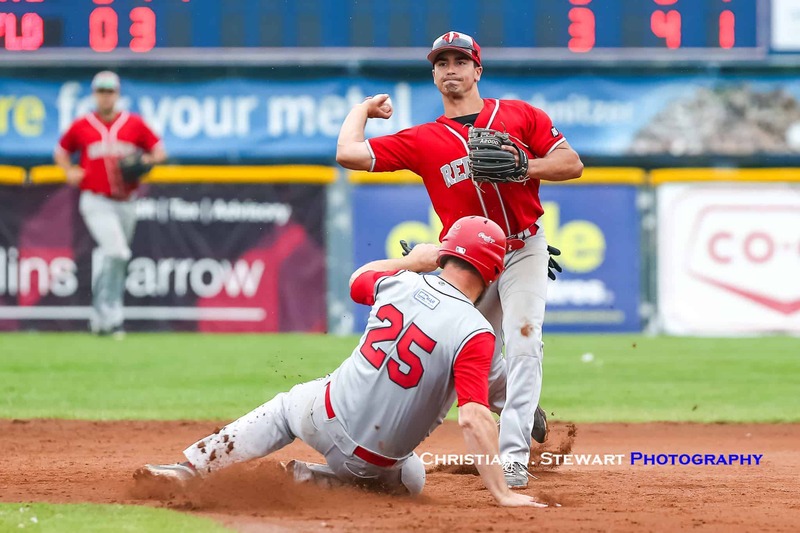 The Thunder advanced directly to Sunday’s semi-final thanks to their 7-1 win over the Dodgers in the Thunder’s final game of the round robin at Lambrick Park in Victoria. The win improves the Thunder’s record to 4-0 and secures first place in Pool A, while Manitoba falls to 1-2 and now needs a win against Victoria in their final game of the round robin (2:00 pm Saturday) to have a chance to advance. In fact, that game now becomes a “win and in” game, with the winner advancing to Saturday night’s playoff round at Wilson’s Group Stadium. 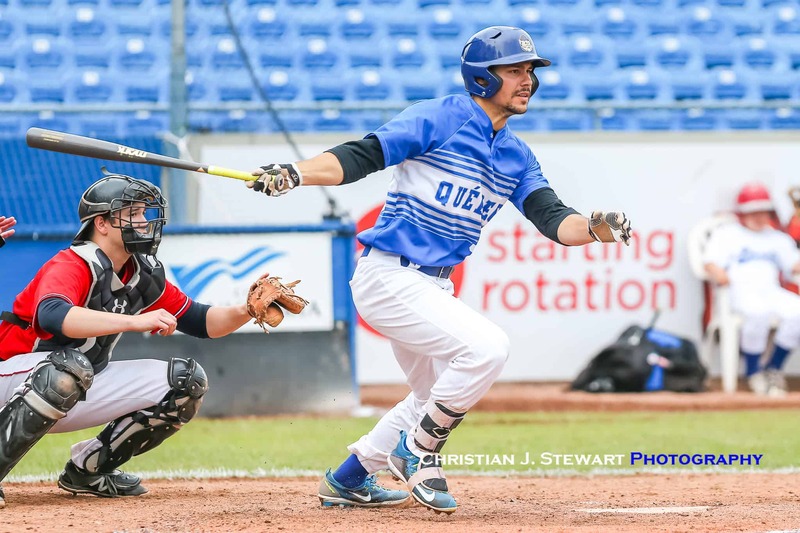 Team Quebec, by virtue of their 8-7 extra-inning win over the Riggers, moved their record to 3-1 and thereby clinched at least first or second in Pool B, pending the outcome of the British Columbia vs. Newfoundland game later Saturday. A BC win in that game would also give BC a 3-1 record and first place in the pool thanks to their previous 8-2 win over Quebec on Friday. New Brunswick, in second game action at Lambrick Park, advanced into the playoff round with a 3-1 win over Nova Scotia. The win improved their record to 2-2 and gave them either second or third place in Pool A behind Ontario 2 pending the outcome of the Victoria and Manitoba game at 2:00 pm. 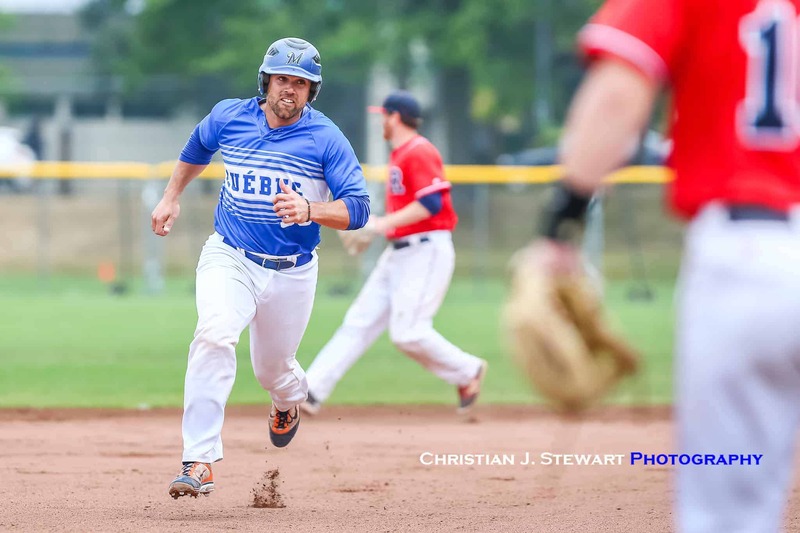 At Lambrick Park early Saturday morning, Manitoba kept things close until the fourth inning, when the Thunder exploded for four runs, then adding another two in the fifth to put the game away. Leading the way offensively for Tecumseh (ON1) was led by MATT SYKES, ERIC CUNNINGHAM, and CAM GODDARD, all driving in runs in the frame, with Sykes finishing with three RBI on the day. CHRIS HORVATH led Tecumseh to victory on the pitcher’s mound. He surrendered one run on five hits over six innings, striking out four. ERIC CARDUCCI threw one inning in relief out of the bullpen. Scott Beever took the loss for Manitoba. He allowed four hits and five runs over three and two-thirds innings, striking out three. Over at Wilsons Group Stadium, the Ilderton Red Army (Ontario 2) scored runs in each of their seven innings at bat en route to a 16-6 win over the St. John’s Capitals (Newfoundland and Labrador). The win moves the Red Army to 2-2 for the tournament and keeps their playoff hopes alive pending the outcome of other games Saturday. Newfoundland drops to 1-2 and must win their final game against British Columbia later Saturday to have a chance to advance. Ilderton scored three runs in the first inning and rolled from there with single runs each in the second and third, a two-spot in the fourth, one more in the fifth, three more in the sixth and three more in the seventh to put the game out of reach. Leading the way offensively was Andrew Firth with four hits and four RBI, Nolan Anderson with a hit and three RBI, while Alex Thrower had three hits, an RBI and three runs scored. In game two action at Wilson’s Group Stadium, Quebec held a 6-3 lead heading into the bottom of the seventh inning, but a three run homer from Alberta’s Ty Russell tied the game up to send it to extra innings. 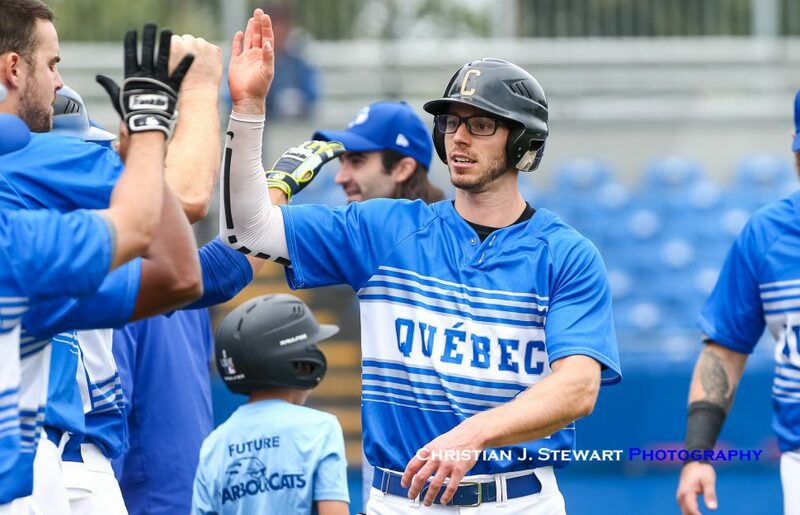 An RBI double by Quebec’s Jean Luc Blaquiere, his third hit and third RBI of the game, in the top of the ninth, then put Quebec ahead 7-6, while Fracois Lafreniere then followed with another double to score Blaquiere and increase the lead to 8-6. 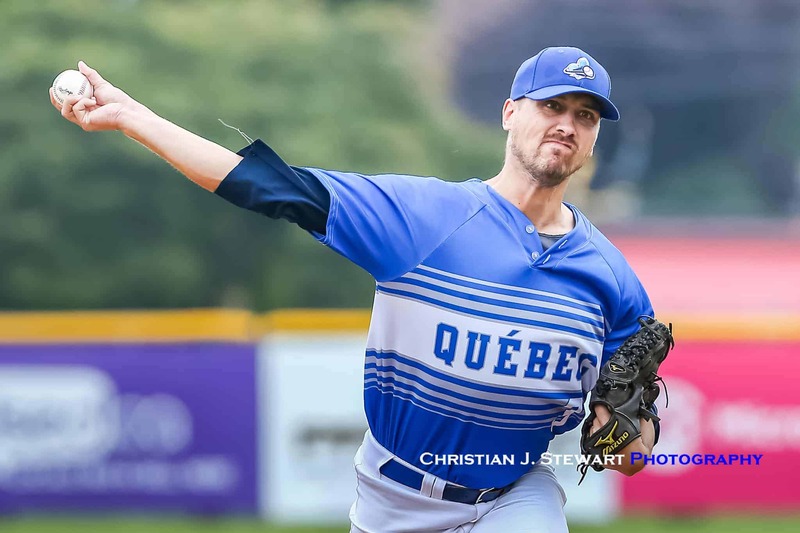 Quebec starter Matthew Poirer was excellent in the win, going 5.2 innings and allowing the two Red Deer runs on seven hits. 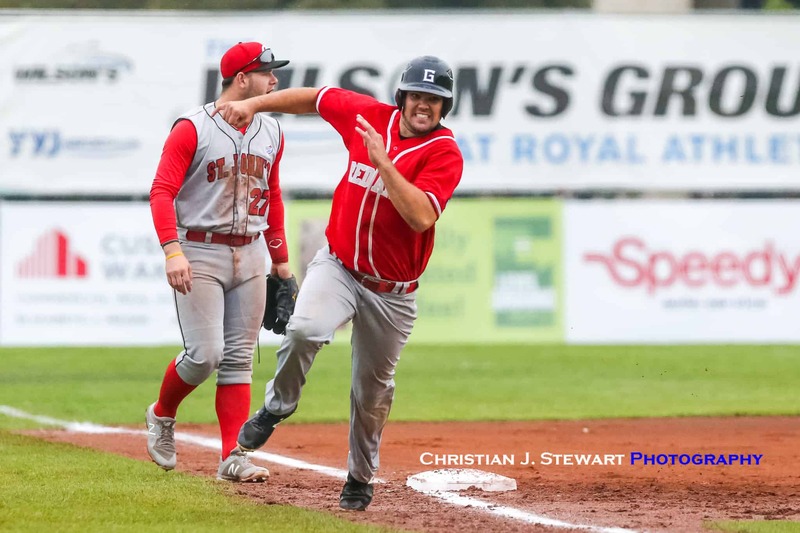 He was relieved by Jonathan Raftus who would get Quebec out of trouble in the bottom of the sixth when Red Deer loaded the bases with two outs. Finally in second game action at Lambrick Park, New Brunswick scored once in the first, once in the third and then added a big insurance run in the bottom of the sixth to advance into the playoff round with a 3-1 win over Nova Scotia. Nova Scotia threatened with the tying runs at second and third in the top of the seventh but could not get anything across. Sam Lund led the way for New Brunswick with three hits, an RBI and two runs scored, while pitcher Shaun OToole earned the victory on the hill for. He went five and a third innings, allowing one run on five hits and striking out three. Colby Lyle threw one and two-thirds innings in relief out of the bullpen. Lyle recorded the last five outs to earn the save. Colby Turple took the loss for Nova Scotia. He surrendered three runs on seven hits over six innings, striking out four. The loss eliminates Nova Scotia from playoff contention.